Provides the best quality in the tightest of spaces! Mighty Mini Pads were designed alongside the Mighty Mini Polisher to provide an easy buffing experience while maximizing the quality of the results received. Mighty Mini Pads are composed of a sturdy foam that is more resilient to wear, reducing the frequency with which they need to be replaced. The open-cell structure of the foam of Mighty Mini Pads allows the pads to absorb more of the product you are using with them, increasing the working time of your products to result in better end results. Mighty Mini Pads are compatible with any backing plate that is designed to accommodate hook and loop buffing pads, like the Mighty Mini Rotary Backing Plates. Because pads are used to generate friction during the buffing process, they will gradually wear and degrade as a result. This is true for any and all buffing pads. This can be a heavy point of annoyance for those that are adamant in their love for detailing. Constantly having to replace and throw away your buffing pads due to wear and tear is one of the only annoying aspects of automotive detailing. In order to combat this issue, they designed their Mighty Mini Pads with foam that is tested to have increased durability. The increased durability of the Mighty Mini Pads will not only reduce the frustration of having to replace your pads, but will also save you quite a lot of money over the lifetime of your detailing career! Mighty Mini Pads were developed using foam that has an open-cell structure, making them much more porous and absorbent than they would be otherwise. It is important when selecting which buffing pads to use that you take into account the absorbency of the pads. If you are using pads that are not porous and prevent the product from sinking into the pad, you are doing yourself a disservice. You may as well be applying your favorite polish with a chunk of concrete. If the product remains only on the surface of the pad, then as you work the product on your paint, it will dissipate more quickly and greatly increase the likelihood of swirls and marring caused during the buffing process. Mighty Mini Pads were developed using foam that has an open-cell structure, making them much more porous and absorbent than they would be otherwise. 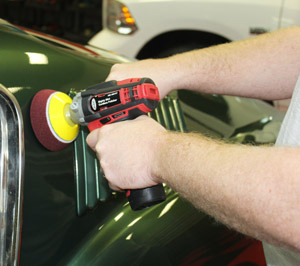 But the porousness of the Mighty Mini Pads does not only increase the safety to your paint during the buffing process. This will increase the working time of the product, and a longer work time generates better results from your product! As the detailing industry evolves and moves over to a more standardized method of developing tools, the pads that they are used with must also advance to make sure they are compatible. The industry standard for the manufacturing of backing plates has moved over to a hook and loop method of attachment. To make sure that you are able to use the Mighty Mini Pads with more modern backing plate styles, they are designed to be compatible with the standard hook and loop attachment method. Mighty Mini Pads will make sure every inch of your paint carries a brilliant shine!